“Never doubt that a small group of thoughtful, committed, organized citizens can change the world; indeed, it’s the only thing that ever has.” Margaret Mead — This quote helps explain why a small group of volunteer Cannabis advocates are in the position to address the WHO and its commitments to reframe the world Cannabis policy. Monday, 4 June 2018, the World Health Organization (WHO) has begun to repair a Century-old injustice: the global prohibition of Cannabis. 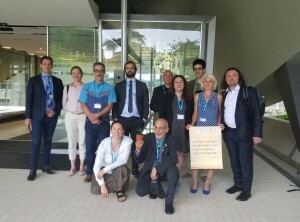 This 40th meeting of the WHO Expert Committee, whose job is to update drug-Treaties based upon evidence , was entirely dedicated to reviewing Cannabis, for the first time ever! Presenting in the opening hearing were MDs, patients and researchers, and 2 tiny Cannabis plants . Although this time the outcome of the Experts’ work will only be preliminary, the process might very well lead to a change of Cannabis scheduling under the anti-drug Treaties . The NGO FAAAT is the focal point between WHO, civil society and Member State governments. FAAAT submitted a contribution to the process endorsed by +100 NGOs from +35 countries in all continents [attached]. We challenge media to engage participants in these historic meetings as you cover this story of international Cannabis policy reform. Michael Krawitz, US air force veteran, medical Cannabis patient (NGO Veterans for Medical Cannabis Access, USA). Myrtle Clarke & Julian Stobbs (Dagga Couple), presenters from South Africa at the Monday hearing. Willem K. Scholten, former WHO official, expert in pharmaceutical regulatory affairs and access to painkillers policies, former Head of the Dutch Office of Medicinal Cannabis, Ministry of Health (Netherlands). Resume of the open session and the 40th WHO Expert Committee meeting. Cannabis international scheduling and the WHO process explained. Tweet at the WHO meeting.